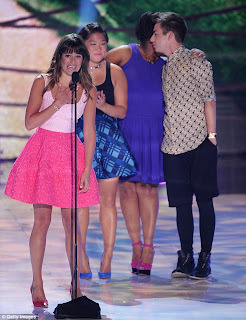 Lea Michele and the rest of the Glee cast dedicated their Teen Choice Award win to their former beloved co-star and friend Cory Monteith who died earlier this summer due to drug overdose. 'I just wanted to be here today to personally thank all of you and tell everyone out there how much all of your love and support has meant to me over these very difficult past few weeks,' the 26-year-old said. 'Not that I had any doubt before, but you guys are most certainly the greatest fans in the world. I wanted to dedicate this award to Cory, and for all of you out there who loved and admired Cory as much as I did. I promise that with your love, we'll get through this together. 'He was very special to me and to the world, and we were all lucky to witness his incredible talent, his handsome smile and his beautiful, beautiful heart. 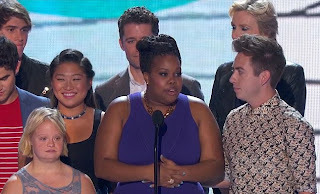 'Although we lost someone that we really love, that you guys love too, we are very fortunate to come back [for the next season],' she said. 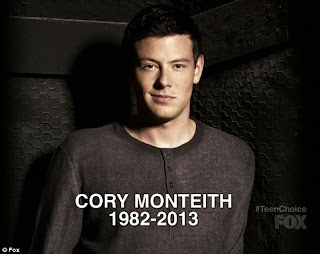 'Cory was like a brother to us and like a dad, and you know he was always ready to sign an autograph for a fan -- he loved you gleeks and he loves his fans. 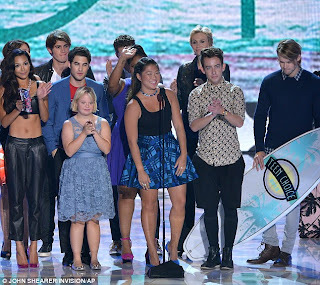 The Teen Choice Award took place on Sunday Night at the Gibson Amphitheatre in Los Angeles.